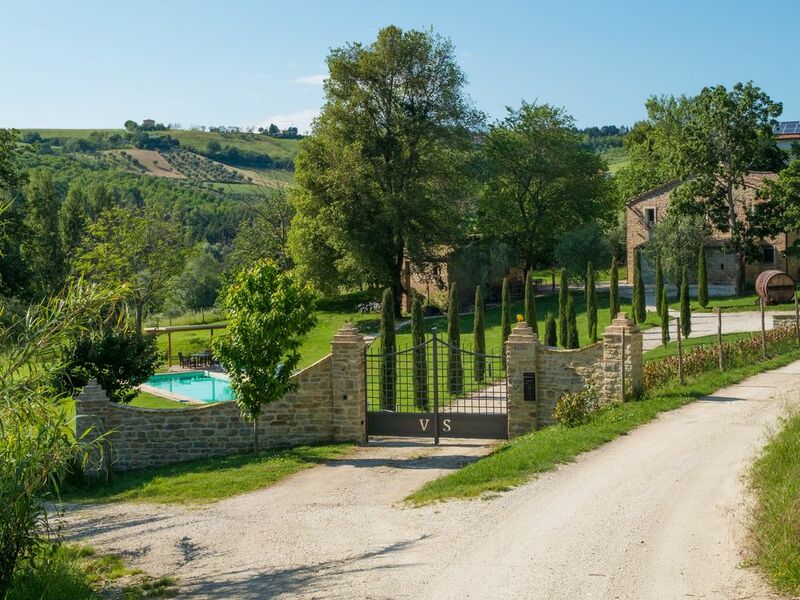 Villa Staffieri has been renovated and restored to bring together both comfort and style, while at the same time celebrating the beautiful architecture of Italian stone farmhouses. Set on the edge of a hilltop village, flanked by vineyards of the region's famous Verdicchio grapes, the house enjoys a rural setting with amenities such as Pizzeria, Bar & Shop, only a 5mins walk away. The large 14m x 5m pool set in a southern position offers superb views of the surrounding area. Villa Staffieri has been created to provide you with the ultimate summer holiday rental with its high standards of comfort and style. Enjoy self-catering at its best with its contemporary, well-equipped kitchen. Deep leather sofas and open fire make lounging compulsory in the spacious lounge and 4 beautifully appointed bedrooms, all with ensuite bathrooms, create the perfect end to wonderful days. Additional activities:: Beaches: Le Marche lies on the eastern side of central Italy, with fabulous blue-flag beaches running along the clear Adriatic Sea. In true Italian style, take a sun lounger for the day at nearby Senigalia, Numana or Sirolo. Wine tours and tasting sessions: Take advantage of this wonderful wine region by enjoying a tour and tasting session at one of the many local vineyards. Our favourite is a small 'family-run' business whose wines have recently made their mark on the world wine stage. Some of their Verdicchio grapes come from the vineyards next to our garden. toilet, shower, bidet, His and hers basin. Site-seeing: The thriving and elegant town of Jesi is the nearest main town to the Villa. It has a lively cultural life, a good civic art gallery and many architectural beauties to endear you. It also boasts a prestigious autumn Opera Season ‘Pergolesi’. Other must-sees include Urbino (42miles), a jewel of a renaissance city with art collections to rival that of Uffizi in Florence, Frasassi Caves (10miles), some of the most spectacular limestone caves that you are ever likely to visit, and Cingoli (20miles), called the balcony of Le Marche by virtue of the superb panoramic views of the region that it offers. Assisi and Perugia in neighbouring Umbria are just over an hour's drive away and worth a trip. Beaches - the nearest blue-flag beach of the clear Adriatic Sea is only a 25min drive away. Walking: This region, peppered with charming hill-top villages, has an abundance of good walks – with even an excellent walk starting right from the villa itself! Shopping: Discount designer shopping is one of the most popular pastimes of stylish Italians, and after only a short drive away, it can be yours too if you fancy grabbing a bargain at Prada, Tods and Armani........plus lots more!.